Well, I finally finished them. Unfortunately, they are a bit too short - just enough to make them uncomfortable to wear. Hopefully some blocking will stretch them out enough. Ugggghhh I'm in a bad mood. This Tuesday is the birthday of a good friend of mine from school. If there was anyone that ever appreciated handmade goods, it's her. 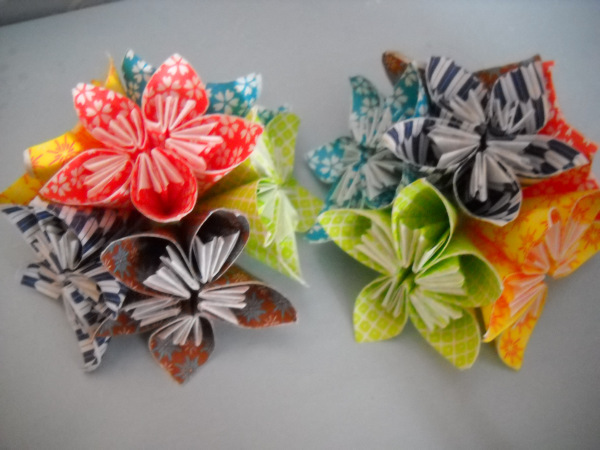 That and how nice she is in general was all the reason I needed to spend some time on this very pretty (albeit a little different) paper flower. Down the street from my school is the art store Blick, which I had never been in before. I usually only go into craft stores that supply a large variety of yarn, which this store does not. I couldn't have been more wrong about how I much I would like this store. I LOVE it! They have the nicest, best craft supplies at SUPER reasonable prices. Plus, I get a student discount. 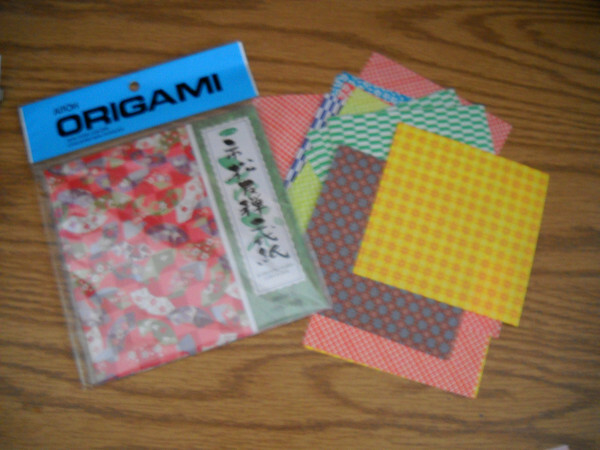 I got almost 100 sheets of origami paper for under $7.00. I can't wait to use the rest of this paper, though I'm not sure yet what I want to do with it. Suggestions would be awesome. 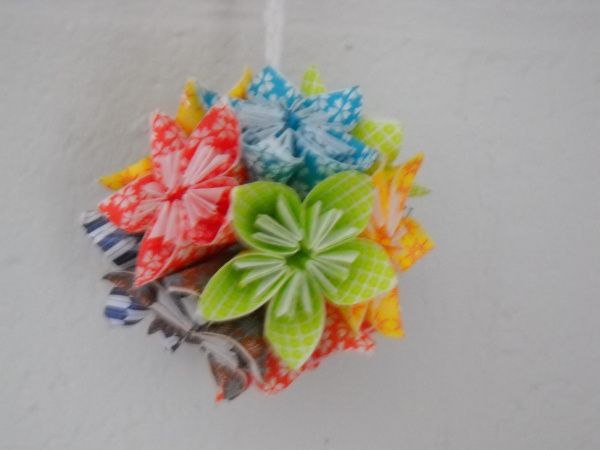 I came across a tutorial online for a Kusudama by Folding Trees. I thought it looked so beautiful and would look great hanging in her dorm room. 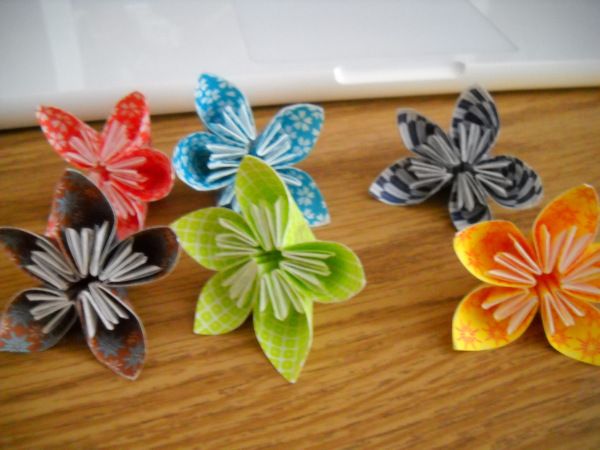 I takes 60 pieces of paper so I cut each origami square into four smaller squares. Each square makes on petal and there are five petals per flower. I was worried it would be tedious but it actually became a very relaxing thing to do. I used double sided tape (I didn't have a glue and it was way too cold to go back out and buy some) to paste all the petal and all the flowers together. It really ended up being awesome and the colors go really well together. I chained a piece of white yarn (I wish I had brought my fishing wire to school with me) and glued it between the halves so that she could hang it if she wants. I think it will look really cute. I had a lot of fun making this and a lot of paper left over. 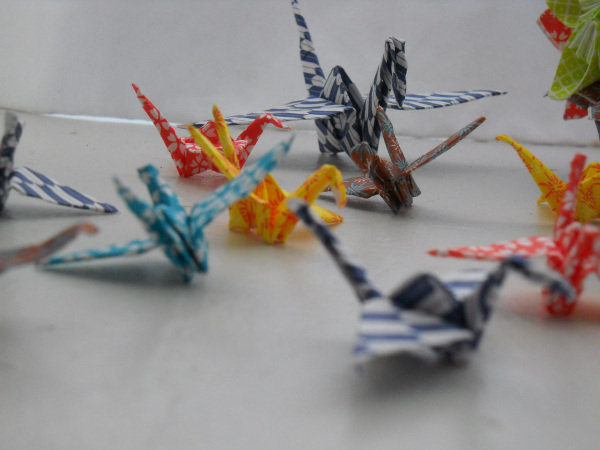 With the scraps from the pieces I cut up I made a bunch of little paper cranes. I definitely want to bring my fishing wire back with me so I can string them over my bed in the dorm. 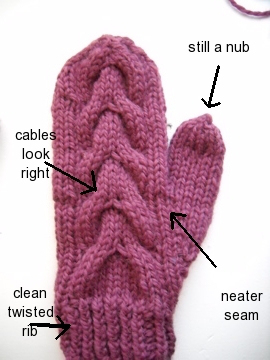 Last week, I lost one mitten that I had made. 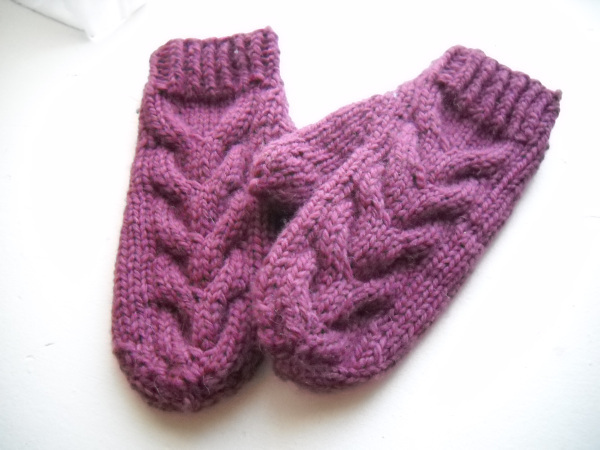 While I still plan on making another one to replace it, I thought I should try Bella's Mittens. Quick Disclaimer: I do not endorse Twilight or any related vampire novel. I always thought they looked really nice and their popularity only made me want to make a pair myself. I wanted to make a shorter version so I looked at others' modifications. The first time, I chose a modification that started at row 28. 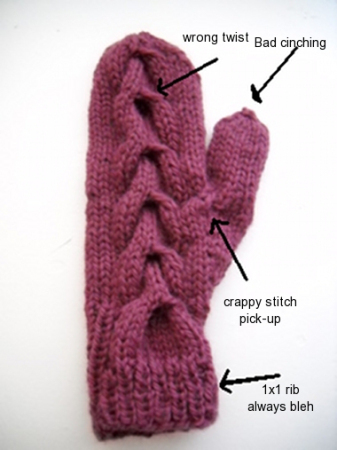 This was just a bad time because at first I tried the magic loop method as the pattern suggested. For some people the magic loop method really works but for me it just resulted in dropped stitches that were too tight on the needle or too loose. Then I decided to go back to the DPNs but still had a hard time making the stitch count work. When I finally finished the cuff, I moved on to the cables which were twisted the wrong. 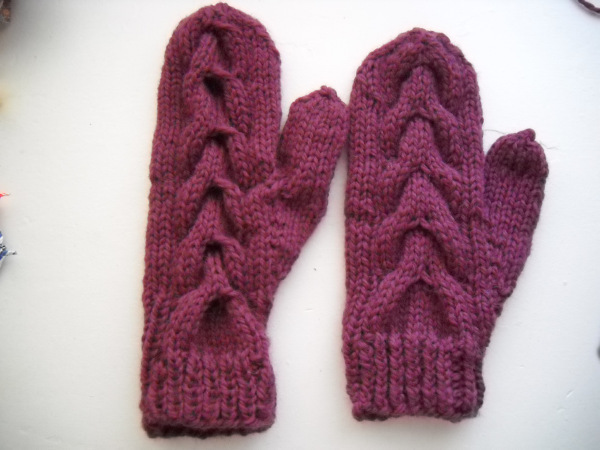 Then at the thumb gusset the stitches got wonky and the pick-ups were out of control. For some super weird reason, I've always hated the way 1x1 rib looked so that on top of everything else made me frustrated with the way it turned out! I think there was a period of five minutes where I was ready to rip all the stitches out very viciously. But by then, though, I had gone through the pattern enough times to have figured out exactly how it works and could make it how I wanted with the techniques that I felt comfortable with. What was supposed to be a fun, simple project turned into a headache, which completely contradicts the reasons WHY I knit at all. 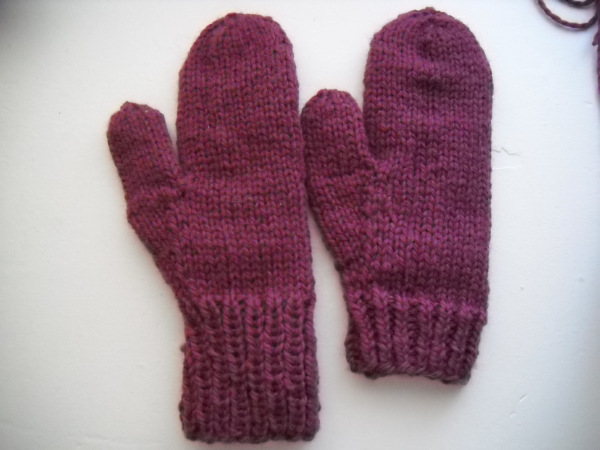 At least now I know how to knit the other mitten and can relax. I think it's because I've had a stressful week at school, too, that this just sent me over the edge. Now I just need to let out a big sigh and keep going. Expect a project page soon on Ravelry. P.S. Yarn = Cascade ECO + bought in NYC. The more I go to school, the more successful I am at procrastinating. 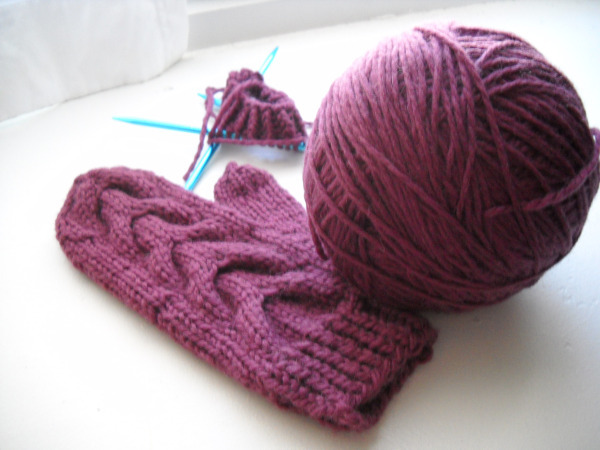 The other day while putting off a history paper I stumbled upon (literally 'stumbled' upon as in the website) a tutorial for double knitting. I've always loved the stockinette stitch and wanted to make a scarf using solely that stitch. Curling, however, will forever be the problem. A tube scarf was an option, but I didn't want to knit a super long scarf of dpns (as dpns are no fun for large items) or a super wide one on a circular needle. (Don't get me started on the magic loop method - nothing has ever so NOT worked for me before). Is this the answer to my perfect scarf prayers? Oooo I hope so.